This is the fifth in a series of reports by the Loughborough University Communication Research Centre on national news reporting of the 2015 UK General Election. We analysed all election news found in the entire duration of all television programmes. For the press, we included election news found on the front page, the first two pages of the domestic news section, the first two pages of any specialist election section and the page containing and facing the papers’ leader editorials. Stopwatch balance for the entire campaign. Directional balance in press reporting for the entire campaign. Issue balance for press and TV for the entire campaign. ‘Stop watch balance’ refers to the relative prominence of political parties in news coverage. We have two measures of this: (1) how much direct quotation time/ space the parties receive in coverage (see figures 1.1 and 1.2) and (2) how frequently party representatives appear in coverage (see Table 1.1). 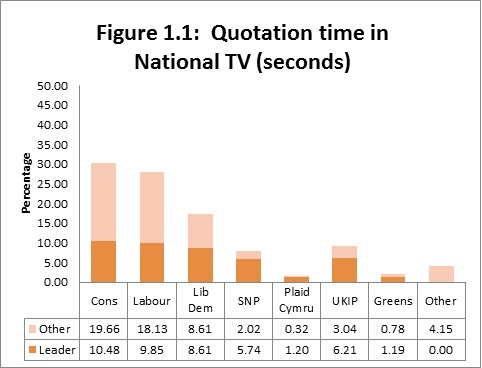 In TV coverage, the ‘quotation gap’ between Conservative and Labour sources narrowed in the final days of the campaign (3.44% last week, 2.16% this week), although the Conservatives had the most direct quotation time overall. Labour sources appeared in coverage slightly more frequently than Conservatives in TV coverage. In press coverage, there is a clearer ‘quotation gap’ and ‘appearance gap’ between Conservatives and Labour. The largest gap is in quotation terms, with Conservative sources being quoted 15.48% more than Labour sources. Press coverage was more ‘presidentialised’ than TV coverage, with 58.42% of the direct quotation coming from party leaders (the equivalent figure for TV being 43.28%). We have also continued to monitor the ‘direction’ of coverage. The purpose of this measure is not just to identify the direction of partisanship but also its scale and changing focus. To measure this aspect, we noted the extent to which each item had positive or negative implications for any of the main political parties. To cover occasions where items addressed positive and negative issues for more than one party, we separately measured positivity or negativity for each of the seven main parties in each item. It is important to emphasise that this is not solely or even mainly a measure of overt support or criticism by a journalist of a party (although these instances would be included in the count). It is a broader measure of the extent to which newspapers report on issues/ comments/ developments that have positive or negative implications for parties. We only coded these instances where these were overtly referred to in the piece. Measuring media evaluations of this kind is not straightforward, as there is a risk that subjective political opinions might influence whether a news angle is seen as positive or negative. Two inter-coder reliability tests were conducted to check the robustness and consistency of these measures. The press-related data had by far the higher level of confidence, and for this reason, are the sole focus of this part of the report. Levels of positive Conservative coverage remained stable during the final stages of the campaign. Levels of negative Labour coverage reduced in the final days, but still remained significantly high. 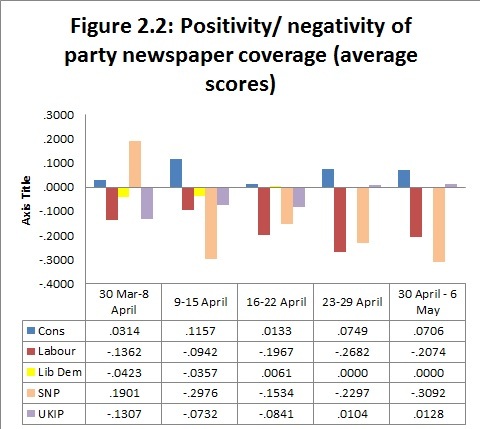 There was an appreciable increase in the negativity of SNP coverage in the final stages of the campaign. Lib Democrats started to register some degree of negative evaluative coverage in the last sample period. Previous to that, they received little evaluative coverage of any kind. Figure 2.2, provides a similar analysis of evaluative changes throughout the campaign, but this time without weighting items for circulation. In some respects, this produces a less dramatic picture (e.g. Conservative positive reporting is less pronounced, the gap between Conservative positivity and Labour negativity is not as wide). In other respects, it produces a more dramatic picture (e.g. 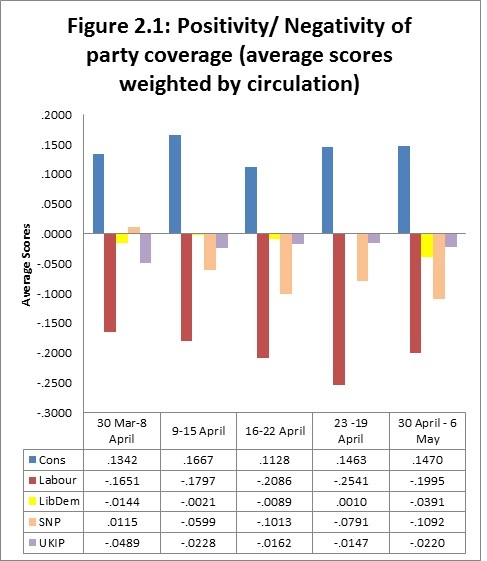 the frequency of coverage with negative implications for the SNP exceeded that found for Labour in 2 of the five sample periods, Nicola Sturgeon’s successful performance in the 2 April Leadership debates had a far greater up-lift effect in the first sample period). The disparity between figures 2.1 and 2.2 are explained by different concentrations of positive/ negative coverage across the press. Pro Conservative and anti Labour coverage was particularly evident among newspapers with the higher circulation. 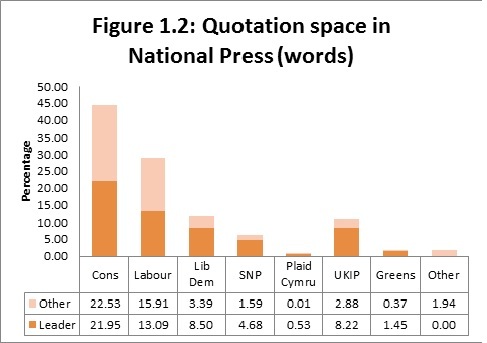 Positive/ negative coverage of the SNP was mainly located in the ‘quality’ press for the first two sample periods, but started to gain wider prominence across all titles in the last three sample periods. Table 3.1 compares the main issues in election news coverage in TV and press coverage. Coverage of the electoral process itself dominated both news sectors, to very similar extents. Taxation issues also featured prominently in both sectors (3rd most prominent in press coverage, 4th in TV coverage). Overall, the priorities and proportions of issues in TV and press were remarkably similar. The apparent variation in the rankings of themes towards the bottom of the table is a ‘vanity of small difference’. Constitutional issues, particularly concerning devolution and its discontents, gained proportionally more coverage in TV coverage than the press. Coverage of ‘standards/ corruption/ sleaze’ gained greater relative prominence in newspaper coverage. ‘Immigration/ migration/ race’ and ‘NHS’ issues were either 6th / 7th in TV and press coverage. ‘Europe’ received relatively more coverage in the press than TV, but was marginalised in both sectors. Several other significant issues of public concern registered very little attention, in particular ‘Education’, ‘Foreign policy [excluding EU]’ and the ‘Environment’. Table 4.1 lists the most prominent individuals in Election coverage for the entire campaign. For all the talk about the fragmentation of the political mainstream, the leaders of the two main parties dominated the media election, accounting for 30% of all the political appearances in coverage since 30 March. Nicola Sturgeon came close to third place, with Nigel Farage not far behind. Samantha Cameron appeared more frequently than Leanne Wood. Men occupy 16 of the top 20 positions. The Loughborough Communication Research Centre (LCRC), based at the Department of Social Sciences, Loughborough University, has substantial experience of conducting media content audits. It has worked closely with a range of funding bodies, charities and the public sector organisations including: the BBC Trust, Ofcom, The Guardian and the Electoral Commission. Since 1992, it has conducted an analysis of news coverage of the British general election campaign. The LCRC draws on the experience of its members who are leading international media and political analysts who have published widely in the fields of communication research and methodology. The LCRC has no links with any political parties or interest groups, nor has it conducted research or consultancy on behalf of organisations that could be categorised in these terms. See https://blog.lboro.ac.uk/general-election/. Ensuring reliability between coders is an essential aspect of any project involving content analysis and especially in large scale projects such as this. For the results of any content analysis to be deemed reliable there needs to be a high level of agreement between two or more coders when coding the same news item. This research ensures such levels of reliability are achieved through a number of measures. 1, using post-doctoral researchers and doctoral students working in the LCRC whose research concerns the media; 2, providing rigorous coder training prior to the analysis; 3, conducting a close monitoring of coders during the campaign; and 4, conducting reliability tests and addressing any areas of weakness these expose.